UPDATE, Feb. 8: As confirmed by Chance the Rapper, 'Shot in the Dark' is set to premiere on FOX on Feb. 24. "Shot in the Dark is an authentic and realistic look at high school sports in Chicago and what it means for our youth," Chance said in a press release. "It's not really a game for some of us." 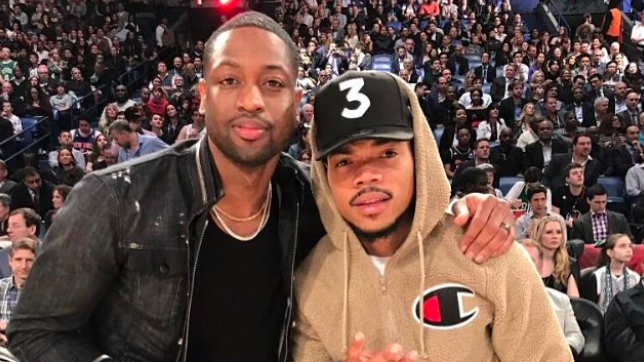 Chance the Rapper and Dwyane Wade, both heroes in their hometowns of Chicago and beyond, are teaming up to put on for their city, once again. As reported, the rapper and the NBA player are joining forces to produce a new documentary, Shot in the Dark, which will tell the story of Orr Academy players Tyquone Greer and Marquise Pryor. The film will follow the star players as they navigate through struggles, such as systematic racism, and life in Chicago as they turn to basketball to build the foundation for their future. "Basketball empowered me to overcome the challenges of growing up on the southside of Chicago," Wade said in a statement. "The odds were stacked against me, and the game changed the course of my life. It's important to share these true stories of triumph to inspire the next generation to achieve their dreams when faced with life's obstacles." Chance also spoke on the project, adding, "Shot in the Dark is an authentic and realistic look at high school sports in Chicago and what it means for our youth. It's not really a game for some of us." As reported, the documentary is set to air in February 2018 on Fox. It is to be part of a series called Magnify, whose first film, 89 Blocks, is scheduled to debut on Nov. 26. Take a look at the trailer for the upcoming project below.